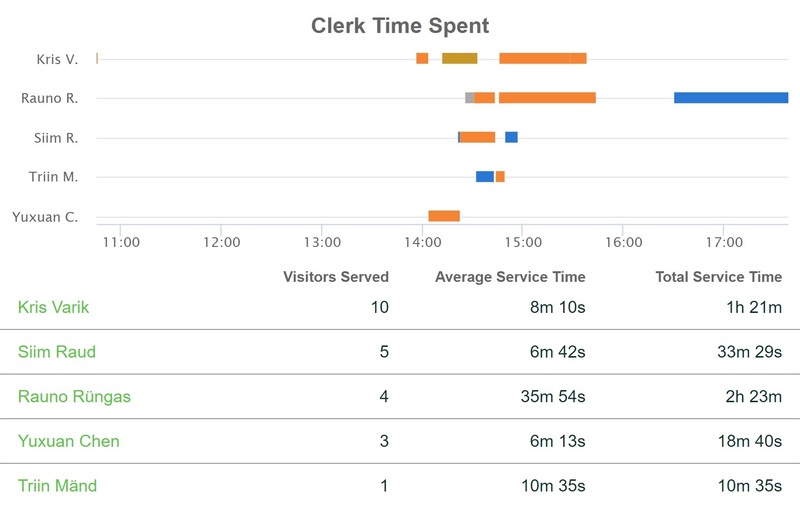 View your daily progress and keep an eye on clerk performance. Qminder's Overview page takes all the action from the Service View and compiles it into a clear summary. You can always get to the Overview by clicking on the Qminder logo in the top-left corner of the dashboard. 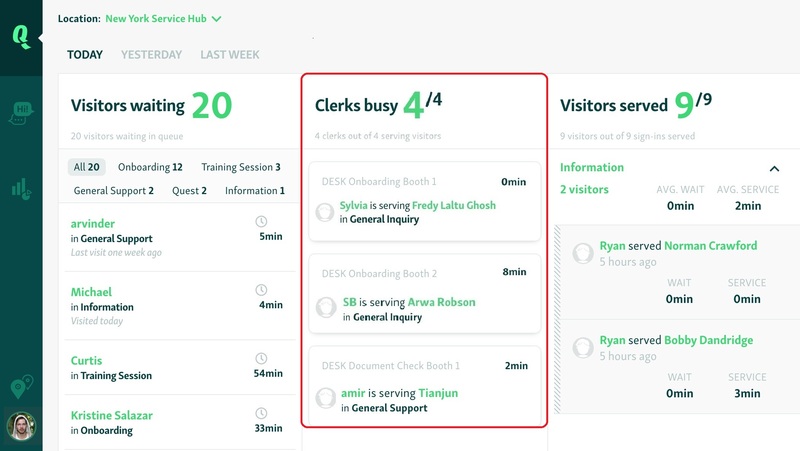 Clerks can see the daily information from the current day and their performance data from the day before. Location managers and administrators can also see statistics from the previous week. 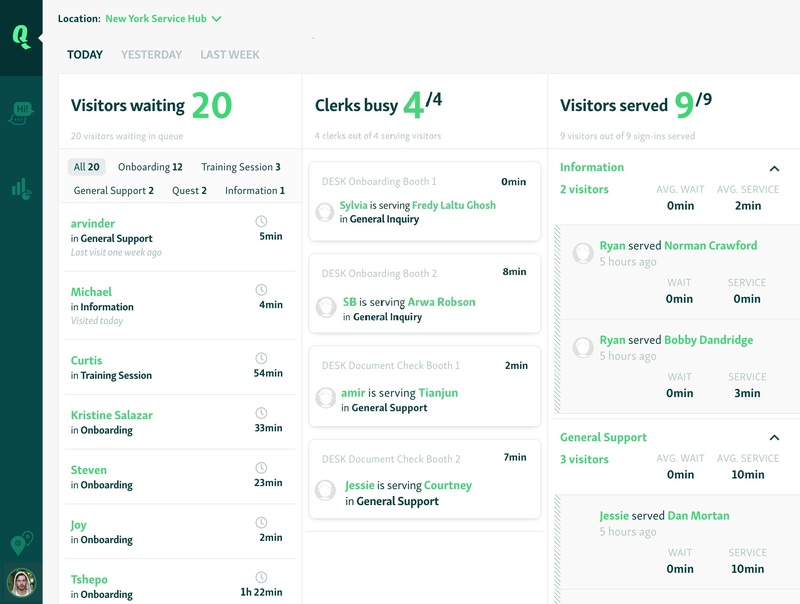 The Today view gives a quick recap of the current service situation. Visitors waiting — how many visitors are in queue. Clerks busy — how many clerks are serving. Visitors served — how many visitors have been served. 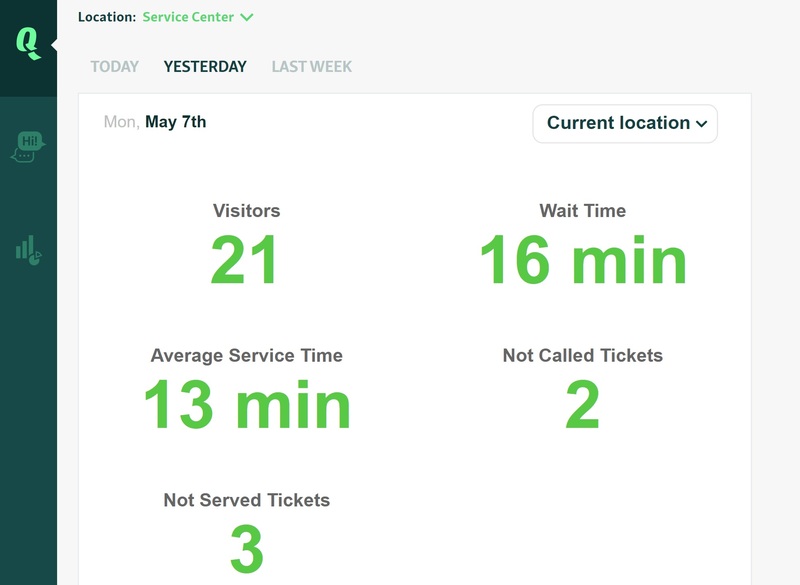 After serving your first visitor, the Overview will display a message detailing your served visitor count and average service time. Overview displays even more information under each statistics category. You can filter the waiting visitors list by line. Click on the line name which visitors you wish to see. If the visitor's inserted information includes a phone number or email address, the system will find the last visitor entry with the same detail and display how long ago the last was (e.g. Visited today; Last visit one week ago). The Clerks busy list will show you which clerk is serving which visitor or how many minutes ago a clerk finished service (if they're currently not serving anyone). 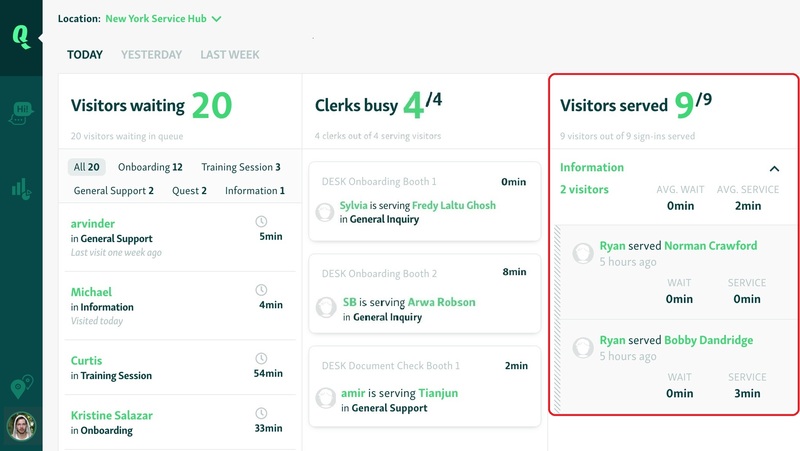 TIP: If you notice that a clerk has forgotten to finish service, click on the visitor's name and mark them as served on the next screen by clicking on the green "Mark Served" button. The served visitors list is divided by lines. Clicking on a line will display all the visitors who have been served in that line. The Yesterday view uses the gathered data from the day before to give an overview of all the activity that has happened on that day. NB: In the top-right corner, you can choose between All locations and Current location. This option is only available if the user has access to more than one location. 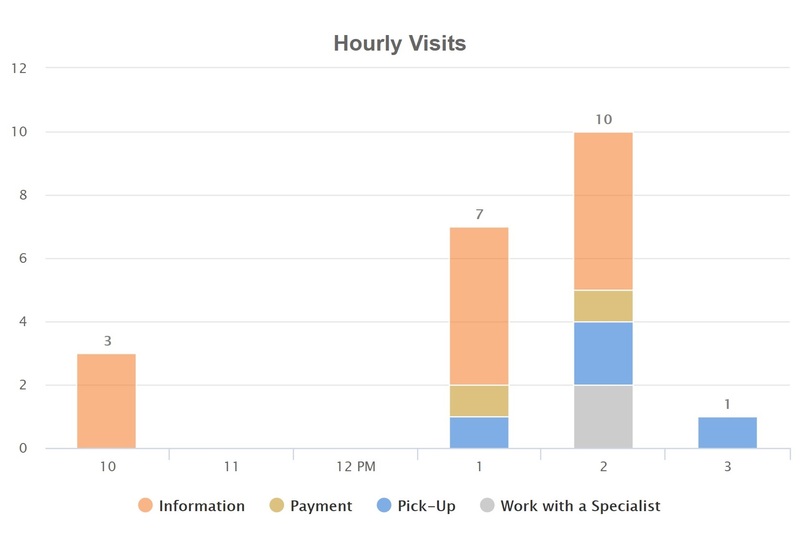 In addition, Qminder also provides graphs depicting Hourly Visits and Clerk Time Spent. Here you can neatly see what each clerk was doing the day before, including in which line and how long their service took. You can use this graph with the additional visitor volume statistics Qminder provides to help determine the staffing plan (at what time do you need more clerks, what is a good time for having breaks, when to switch shifts). 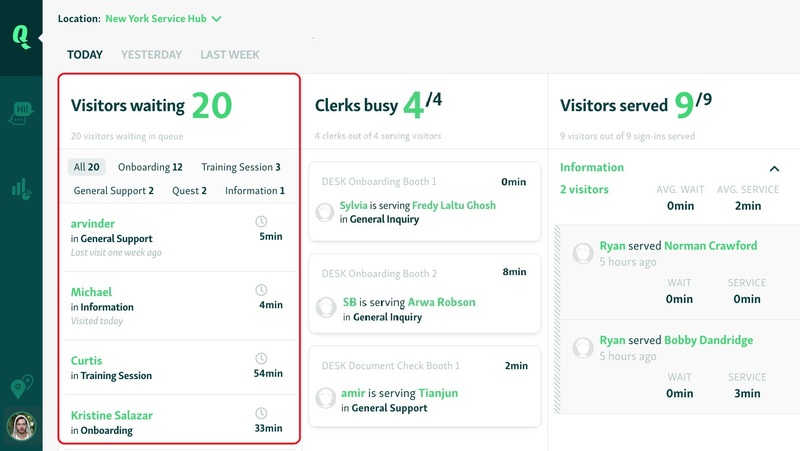 TIP: Clerks can check Clerk Time Spent numbers to learn how they're doing compared to coworkers. The Last Week view is only available to location manager and administrator users. The Last Week view is similar to the Yesterday view, but consists of data gathered from the previous week instead of just the previous day, and also offers more statistics and graphs. You can choose between data from either the current location or all locations.